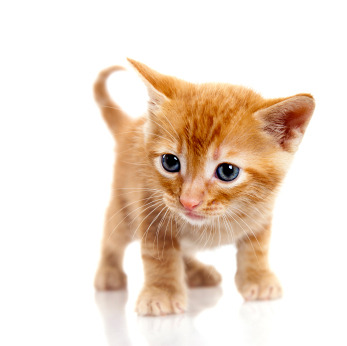 Kittens have a huge repertoire of different sounds, far wider than most other animals. Everything a kitten experiences in her first, formative months has an effect on the rest of her life. Your kitten can develop habits very quickly and, often, it can be quite hard to get her out of them. As soon as your new kitten sets paw in her new home for the first time she's relying on you to take good care of her. Here are a few tips worth sharing as your precious kitten takes those first tiny steps and begins exploring their new home. The kitchen is probably the most dangerous place of all. Kittens love to curl up somewhere warm. So keep ovens, washing machines and tumble dryers closed and always check them before you switch them on. Also keep plastic bags, clothes lines and pans of boiling water well out of the way. Don’t forget to keep your kitten’s food separate to their water – felines don’t like to eat near water. Also provide them with a variety of eating experiences from an early age. Specially designed DINE KITTEN has the range of flavours and textures your special new addition needs. A kitten’s curiosity is boundless. However hard you try to hide something, they will find it. So before you bring your kitten home lock away anything that looks dangerous. Remember, a small kitten can reach seemingly high shelves with ease. A stylish collar is a great way of showing them how much you care. Surprisingly kittens often quite like having a collar. So treat them to a nice one and attach a tag with your telephone number on it. The good news is a kitten’s extremely strong sense of smell will usually help it find the way home. Your vet is your kitten’s other special friend. They’ll be happy to share lots of extra ways to keep your kitten safe and healthy, way beyond just keeping them indoors for two weeks after vaccination. Many cat lovers have more than one feline friend, If you do, make sure your kitten has his or her own kitty litter and that these are ideally in separate areas. Kids love kittens. But they can be clumsy and unintentionally injure fragile little bones with an innocent cuddle. Dogs and cats also can be jealous of new arrivals. So always share new experiences together. It’s also a great way of bonding and creating a happy home. Practical tips aside, most important of all is affectionately showing your kitten just how precious they are to you.